DutzWorks - Illustration and Graphic Design by Derrick Utz: "Building an Epic!" Part 2 - Negative Space! "Building an Epic!" Part 2 - Negative Space! Welcome to the second installment in a short series of tutorials of an epic proportion!!! Hello!!! I am sorry it has taken so long to get to this new post but I am thrilled to finally write it!!! This was actually a difficult topic to research but I believe I have enough to really nail it home. Today I want to talk about negative space in comic and fantasy illustration. This is not the common negative space you see with a black and white image and it is simply a series of images that can be pulled from the silhouette of the subject. Instead, I am describing the compositional approach that uses different elements to draw attention to a single subject or action to create impact on an audience. The reason I approached this topic after the first Building an Epic Post about Scale is because it uses elements of scale in its execution. It is best to understand one before the other. Negative space to me is the use of the page, panel frame and content to create impact for one element in the scene. This could be used to create the feeling of the lone warrior, overwhelming odds or even to nail home an emotion like pride or anger. When used correctly, negative space is a tool that can help to connect your audience to your characters or their situations. As an example, below I have a video trailer for the upcoming movie, "Epic." It uses a great combination of scale and negative space/framing to really nail home the vastness of the world and situations that the charters are faced with. Movie Trailer for "Epic." Blow it up to full screen to get the real effect! One of the most important elements of this compositional tool is a single point of focus. This does not need to be one person or thing, it just means that is cannot have the focus spread all over the page or panel. The idea is to have your audience land on the panel and be driven to one point in it in the end. Then, that on point needs to convey a feeling or be connected to the rest of the scene. If it is just the subject and no other content then it is best to have the subject conveying the emotion or message you want to get across. One of my favorite examples of this is from the late Michael Turner and the cover he did for the Fathom: Killian's Tide Series. He chose to have only the subject and no background so you, the audience, would only have him to focus on and you would feel alone with the character. This is one of my favorite pieces from an artist whom I loved and was constantly in awe of. Foreground, Mid-ground, Background. To create a great negative space piece, use these to your advantage. Then add in elements of tone, texture and color to seal the deal. A strong method of achieving this is to use a variety of elements to create the separation of focal point and surroundings. This can be done with everything from the line weights in the illustrations (something I am still working on for myself) to the contrast of the background's texture or color and the subject's own. In many negative spaced pieces I see the foreground as the main stage of the focal point and much of the surroundings in the background. The mid ground can be left empty to create that visual gap that distances the two elements. Last in my list to discuss on the subject of negative space is the thought that goes behind it. It's Composition. 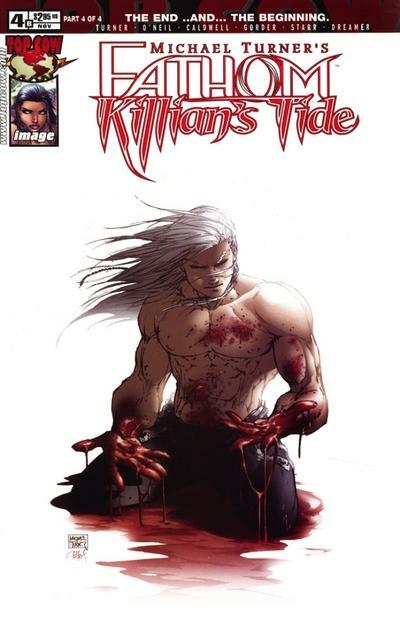 The best epic illustrations that I have come across in or out of comics were great because they were designed well. As the artist, you have the opportunity and ability to create an epic feeling piece on even a sketch if we create it with a high thought process and a direction for the reader/audience to follow. This is one of my favorite parts of creating epic art; I have the chance to tell a grand story with one piece or panel at a time. In respect to composition, it is best to create keeping in mind the ways that people "read" an image. Right to left, top to bottom. In art, your colors, implied lines and shapes create the readability of each piece. 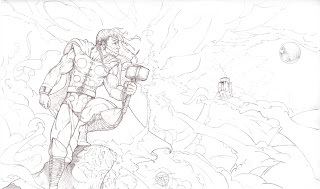 In the Thor illustration at the header of this page, I created this to be red right to left. I knew that with it's frame, a wide-screen set-up, that the audience would read it along it's longest axis. So, when you scan it you see our subject close enough to connect with him and then we reach his face. On it you see an expression that makes you wonder if he is protecting that cliff or launching an attack from it. Then as we "read" further we see a tall hall of Asgard in the distance. Thor has come home and it does not look like it is going to be a good visit! 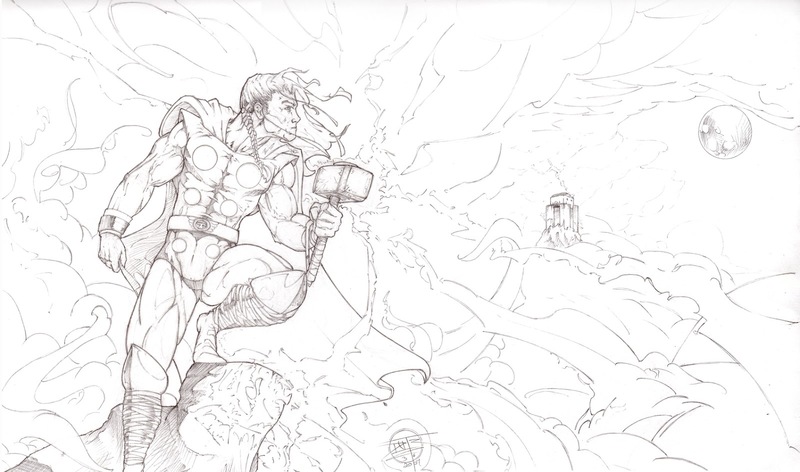 I wanted to have the piece understood in stages and additionally, I wanted the reader to be on the side of Thor. We share a visual space with him on his rock, in the foreground, and then we see him contemplating his goal in the distance. In understanding the greater goal of your composition, you can truly hit home with a message and its weight with well placed content and strong cues. Frazetta was a master of many things and one was the use of negative visual space to add grandeur to a story. In this piece titled, "Conan the Adventurer," he does a wonderful job of telling you so much about who Conan was. He was brutal, strong, in charge and unwavering in his vision of himself. 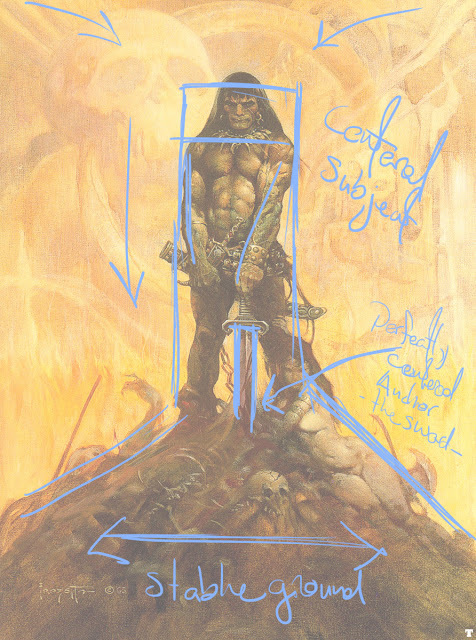 We know this by his build, stance and how Frazetta balanced the piece with him in the center over a triangle-shaped mound (a triangle being one of the most stable shapes) and then anchoring the piece to the sword in the very center of the painting, beneath him and at the top of the mound. There is no doubt that he means business. Thank you all for being patient with me as I got to this post and I hope you all learned something from it. I honestly did in the research for it. As with the last post, I want to close with thoughts on how this information can make your stories better. There are so many visual tools to use that it is hard to choose sometimes so I suggest this; if you want your audience to gasp as your character(s) come to face a single moment of realization or a powerful situation, consider the use of negative space to frame the message and compose it well. 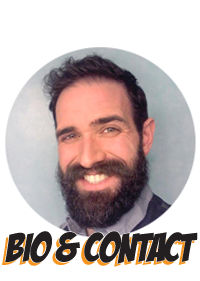 When you do, your readers will see your story through your protagonists eyes...or the eyes of their enemies, and you will create a strong connection to them. And of coarse, the more grand everything is to your protagonists, the more grand it is to your audience. Remember, in their hearts is where the epic happens. 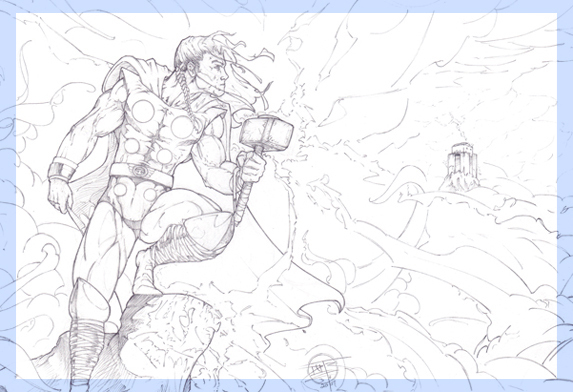 Treat: Click the thumbnail below if you would like to see a high-rez version of the Thor header art.